Here are a bunch of charts and tables for different probabilities in European roulette that might be useful to know. Note: The following probabilities are for European roulette. Check out the American probabilities page if you're playing on a wheel with the double-zero. 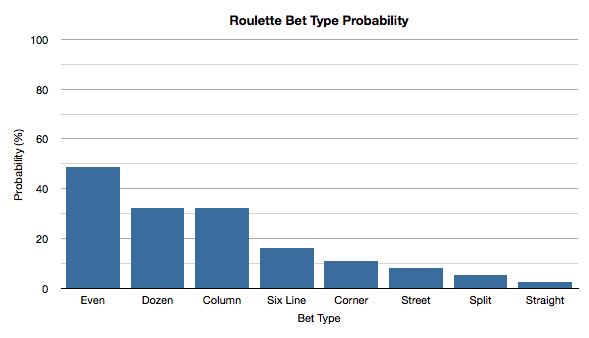 A simple bar chart to highlight the percentage probabilities of the different bet types in roulette coming in. Same even money bet result in a row probability. How unlikely is it to see the same colour 2 or more times in a row? What's the probability of the results of 5 spins of the roulette wheel being red? The following chart highlights the probabilities of the same colour appearing over a certain number of spins of the roulette wheel. Example: The probability of the same colour showing up 4 times in a row is 5.6%. 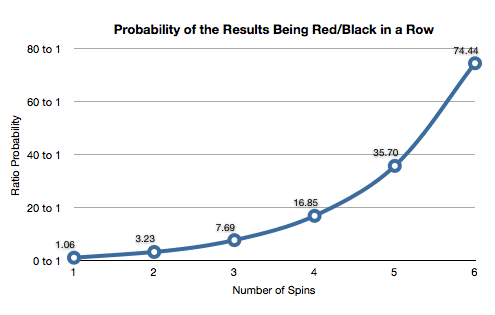 A graph to show the probability of seeing the same colour of red/black (or any "evens" bet result for that matter) over multiple spins. As the graph shows, the probability of seeing the same colour on consecutive spins of the roulette wheel more than halves (well, the ratio probability doubles) from one spin to the next. I stopped the graph at 6 trials/spins, as that was enough to highlight the trend and produce a prettier probability graph. What does each probability format mean? There are a number of ways to display probabilities. On the roulette charts above I have used; ratio odds, percentage odds and sometimes fractional odds. But what do they mean? Percentage odds (%). This is easy. This tells you the percentage of the time an event occurs. As you can see, fractional odds and ratio odds are pretty similar. The main difference is that fractional odds uses the total number of spins, whereas the ratio just splits it up in to two parts. The majority of people are most comfortable using percentage odds, as they're the most widely understood. Feel free to use whatever makes the most sense to you though of course. How to work out roulette probabilities. From my experience, the easiest way to work out probabilities in roulette is to look at the fraction of numbers for your desired probability, then convert to a percentage or ratio from there. For example, lets say you want to know the probability of the result being red on a European wheel. Well, there are 18 red numbers and 37 numbers in total, so the fractional probability is 18/37. Simple. With this easy-to-get fractional probability, you can then convert it to a ratio or percentage. Probabilities over a single spin. Count the amount of numbers that give you the result you want to find the probability for, then put that number over 37 (the total number of possible results). As well as working out the probability of winning on each spin, you can also find the likelihood of losing on each spin. All you have to do is count the numbers that will result in a loss. For example, the probability of losing if you bet on red is 19/37 (18 black numbers + 1 green number). Note: To reduce a fraction down to 1/X, just divide each side by the number on the left. e.g. a bet on red has the probability of 18/37, divide each side by 18 and you've got 1/2.05. Work out the fractional probability for each individual spin (as above), then multiply those fractions together. To keep it simple, I reduced the all fractions for the results above down to the 1/X format. Having probabilities in a fraction format like 18/37 or 1/2.05 is alright, but sometimes it's more useful to see the probability as a percentage or a ratio. Luckily, it's pretty easy to convert to either of these from a fraction. Converting from a fraction to a ratio. Reduce the fraction to the 1/X format, then take 1 away from X and you will get an X to 1 ratio. For example, what is a dozen bet (12/37) as a ratio? Note: You can see how apparent this conversion is in my roulette bets probability table at the top of the page. Converting from a fraction to a percentage. Divide the left side by the right side, then multiply by 100. For example, what is a corner bet (4/37) as a percentage? Important fact about roulette probabilities. The results of the next spin are never influenced by the results of previous spins. The probability of the result being red on one spin of the wheel is 48.6%. That's easy enough. Now, what if I told you that over the last 10 spins, the result had been black each time. What do you think the probability of the result being red on the next spin would be? Higher than 48.6%? Wrong. The probability would be exactly 48.6% again. The roulette wheel doesn't think "I've only delivered black results over the last 10 spins, I better increase the probability of the next result being red to even things up". Unfortunately, roulette wheels are not that thoughtful. If you had just sat down at the roulette table and didn't know that the last 10 spins were black, you wouldn't have a hard time agreeing that the probability of seeing a red on the next spin is 48.6%. Yet if you are aware of recent results, you're tempted to let it affect your judgment. Each and every result is independent of the last, so don't expect the results of future spins to be affected by the results you've seen over previous spins. If you can learn to appreciate this fact, you will save yourself from some disappointment (and frustration) in the future. Believing that a certain result is "due" because of past results is known as the gambler's fallacy. What about that graph above? In the graph of the probability of seeing the same colour over multiple spins of the wheel, it shows that the probability of the result being the same colour halves from one spin to the next. However, this is only if you're looking at the set of trials/spins from the start. If the last spin was red, the chances of the next spin being red are still 48.6% -- they do not drop to 23.7%. On the other hand, if you hadn't spun the wheel to see the first red result and wanted to know the probability of seeing red over the next 2 spins (and not just on the next 1 spin), the probability would be 23.7%.